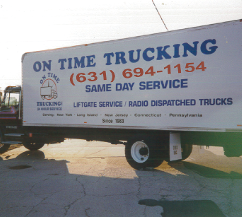 Avoid delays in your business transactions with On Time Trucking in Farmingdale, NY or West Babylon, NY. You can send and receive your products on time with the lift gate delivery or pickup. Our delivery service runs 24 hours a day, 7 days a week, and we keep 2 men per truck in Manhattan. We proudly offer same-day expedited services. We assure you that your products and packages will be protected and delivered on time to the right destination. Our trucking company has $150,000 worth of surveillance cameras at our facility with 18-months storage. We have 40 doors available in Farmingdale, New York. We have 30 to 53 foot trailers with lift gates servicing the metropolitan area daily. We provide a same-day delivery service. With tractors and straight box trucks running every day, we are equipped to serve our clients with short turnaround time. We provide dedicated line haul 24 hours per day, 7 days per week. We provide white glove service for our Fortune 500 companies with our lift gate, 2 men and inside delivery services. Our lift gate delivery service is available to both residential and commercial zones. Ask us about our lift gate delivery trucking services. Contact us in Farmingdale, New York.